Fiordland Penguins are medium sized birds being approximately 60 cms (23.5 inches) in height and weighing between 3.5 and 4 kgs (7.7 - 8.8 lbs). They have a black head and back, and their front is white in colour. They have a orange/yellow stripe that runs from the base of their beak, over their eye and droops down at the back of their head. On their cheeks they have white streaks of feathers that they puff out when defending their nest. They communicate by emitting barking calls when out at sea and by visual and vocal displays while on land. Fiordland Penguins are very timid, usually active on land during the night, and are hardly ever seen during the day. 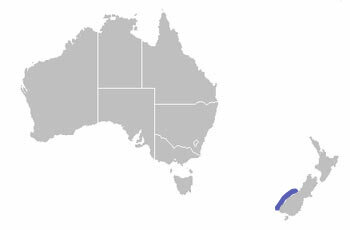 Fiordland Penguins are found in New Zealand. They breed along the Fiordland coast, its outlying islands and Stewart Island. Fiordland Penguins feed upon fish, krill, and squid. They make shallow dives to go and forage and feed. 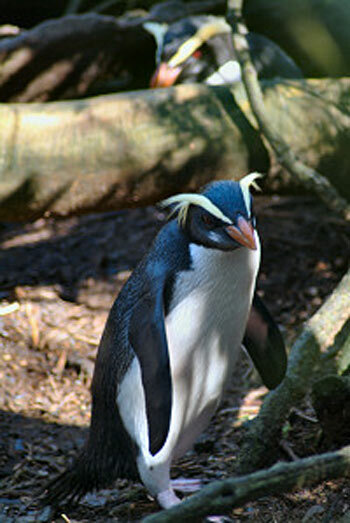 Male Fiordland Penguins return to the breeding site in June, closely followed by the females. They usually return the the nesting site they used the previous year and they construct nests in dense temperate forests, usually under bushes or in rock crevices. They nest in small colonies close to but out of sight of other breeding pairs. In July females will lay 2 eggs and these are incubated by both parents for 30 - 36 days. They each take 5 - 12 day shifts incubating the eggs while the other one goes out to feed at sea. When the chicks hatch usually one is stronger and in most cases the weak one will not survive. The chick is looked after by the male and fed by the female for the first few weeks, then the parents take it in turns to hunt. Sometimes the chicks join a creche with other youngsters, but they always return to their nest to be fed. By the time the chicks reach 10 weeks old they have their adult plumage and they are ready to go to sea. Fiordland Penguins begin to breed when they reach 5 years of age and they return to their home colony to raise their young. Predators of Fiordland Penguins include dogs, cats, ferrets, stoats, rats, weka and fur seals. There are no subspecies of the Fiordland Penguin. The population of Fiordland Penguins is approximately 2,500 pairs.